Exfoliation is a big subject, so I’m going to hit on some summer essentials. As the cell turnover rate within the skin increases due to the hot and humid weather, so does the buildup of dead layers on the surface. Improper exfoliation can be the biggest enemy of the skin. Too much or too aggressive causes inflammation and destroying the barrier function making the skin more susceptible to environmental irritation, sun-sensitivity, and can even damage the skin long- term. Too little and you get a sallow, dull, and lifeless complexion, some even suffer from painful breakouts. Exfoliation 101: chemical exfoliation vs. mechanical exfoliation. For starters, if you are currently an Apricot Scrub user please, please throw it away. Those little beads n seeds are actually causing tiny little cuts all over the face and with time can result in uneven texture and pigmentation issues. I have two substitutes that will work for almost all my clients. The first is your new favorite ingredient, enzymes. These little guys are perfect for summer time. Enzymes come from natural sources like papaya, pineapple, or cranberries. Here in the office I use an amazing product full of cranberry enzymes in my services and it is available for purchase. Why are they so special? Enzymes help the already dead skin cells release from the surface and come off. They aren’t going to do anything to the living tissue, thus resulting in radiant glowing skin. Great exfoliation for all skin types that other methods might be too aggressive, and they are actually hydrating. 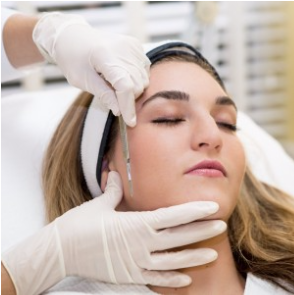 For those looking for a little more aggressive treatment look no further than dermaplaning. Dermaplaning might seem odd and intimidating at first, but the procedure is actually very relaxing with results that can’t be matched. Traditional microdermabrasion is too aggressive for most skin, but most clients want a service that delivers what can’t be achieved at home. It is gentle on the skin and leaves you with a baby-fresh glow. The biggest upside, all the dried up dead layers of the skin are removed means you can use less homecare product overall. Dull skin= layers of dead skin= product being soaked up by cells that aren’t going to benefit because they are already dead. Summertime is manageable. Somehow we survive every year. Please drink plenty of water. Internal hydration can take time, but it absolutely makes its way to the surface of our skin. There is a HUGE difference in the way your skin looks and feels when you are hydrated. Stay cool out there!